On the first floor, we have the gable-end wall that we’ve posted about earlier in the blog. There were 8 big rectangular panels of soggy bricks in a very old oak frame. We’ve kicked the bricks out, replaced them with lovely cork (which is light, breathable, renewable, insulating, and basically perfect for the job). Externally that’s had a scratch coat put on it, but does ned a second coat of lime to add a bit more weatherproofing and make it look pretty. While this was going on, Ken Milloy, our splendid heritage timber man from Ludlow replaced the rotten sole plate and added a couple of repairs to the frame. I’d link to his website, but he’s a bit oldschool for that. 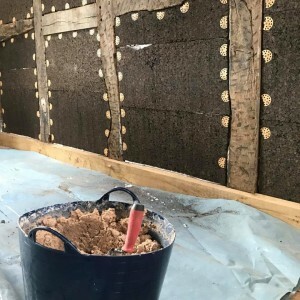 a couple of layers of hemp lime (that’s lime plaster with chopped up hemp in it). The hemp does good things ; it adds strength to the mix, just like adding fibres does. It also reduces the weight of the plaster, which is nice for both the wall and the plasterer. Yesterday we knocked up about 20kg of it, and I squashed it onto the wall. 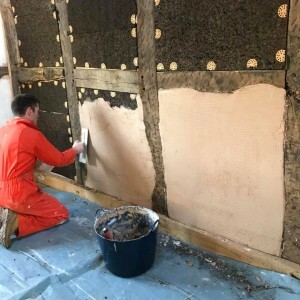 Knocking up is the process of mixing the plaster to get energty into it, and it loosens up the mix and makes it easier to handle and spread around. We also added about a litre of water to it, to loosen it further, as it was pretty chewy and I couldn’t really spread it. It’s unlikely that the finish will end up looking the same as the rest of the attic, so we’ll probably whitewash all the plasterwork to standardise the apearance internally. Once the surface of the first layer was about where I wanted it to be – something between 3mm and 10mm, we pressed a mesh into it. The mesh adds further strength to the layer, and will hopefully prevent cracking later on. It was fairly hard work – both the mixing and the applying, but the end result looks ok to me. I find jobs like this look terrible when you’re doing them, you’re so up close and examining every aspect of what you’re doing. If you go away and look at it an hour later you suddenly realise it’s fine, and it actually looks good. Almost like someone who knows what they’re doing has done it. Almost. Next weekend we’ll hopefully get a few more panels done, if my blisters have subsided by then..
All the materials for this wall have been supplied by Ty-Mawr Lime, who have been hugely generous with their time and advice. If you’re thinking of doing something like this, I’d really reccommend talking to them.